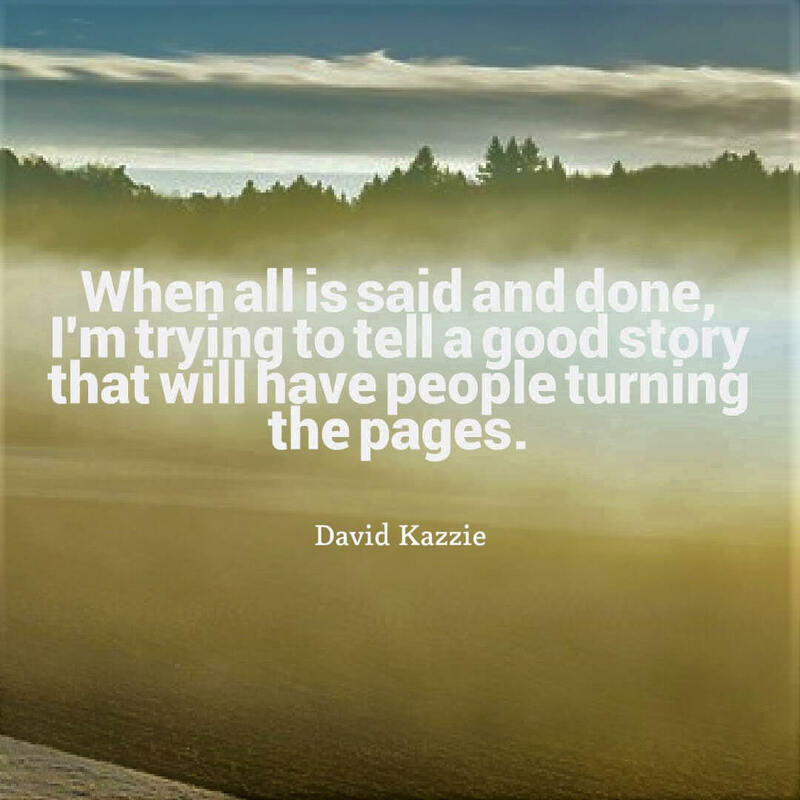 David Kazzie lives in Virginia, where he works as a novelist and lawyer. His first novel, The Jackpot, was a No. 1 legal thriller on Amazon and was published in Bulgaria in April 2015. The Immune was published in serial format in January and February 2015. In May 2015, all four installments of his Immune series were ranked in the Top 10 on the Post-Apocalyptic genre bestseller list. Part I (Unraveling) was ranked No. 1 in Post-Apocalyptic, Dystopian, and Genetic Engineering and reached No. 31 in the Kindle store. The Living, a sequel to The Immune, was published in May 2017. David is also the creator and writer of a series of short animated films that have nearly 3 million hits on YouTube and were featured on CNN, in the Huffington Post, the Washington Post, and the Wall Street Journal. Kris: When you hear the word “editing,” what do you think? David: I think, “Thank Sweet Baby Pokémon, I’ve finished the first draft!” It’s a good feeling knowing that you have something to edit. Just getting to the end of a full-length manuscript is a huge achievement, even if you know that there is as much work ahead of you, if not more, than there was behind you. I write pretty rough first drafts, so while I can’t say I adore editing and want to marry it, I know that this is the stage where I can make the book the best it can be. 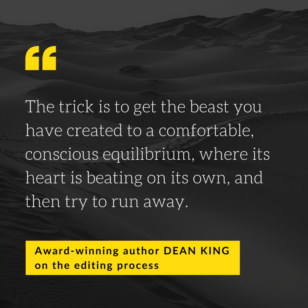 Kris: What does your editing process look like? David: First, I put the manuscript away for several weeks, and I really try to not look at it in that time frame. This helps you come back to with fresh eyes—maybe not as objectively as a third party would—but you’ve created some distance that will help you see all the big-picture and little-picture issues you will need to address. Second, I print it out and read it once all the way through as quickly as possible. This is when I work to identify any really glaring problems. 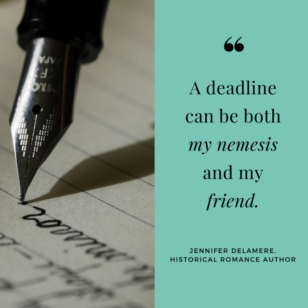 Without fail, First-Draft Me has left some big messes for Current Me, and this is when I start identifying them, making a list of them, and formulating a plan on how to fix them. 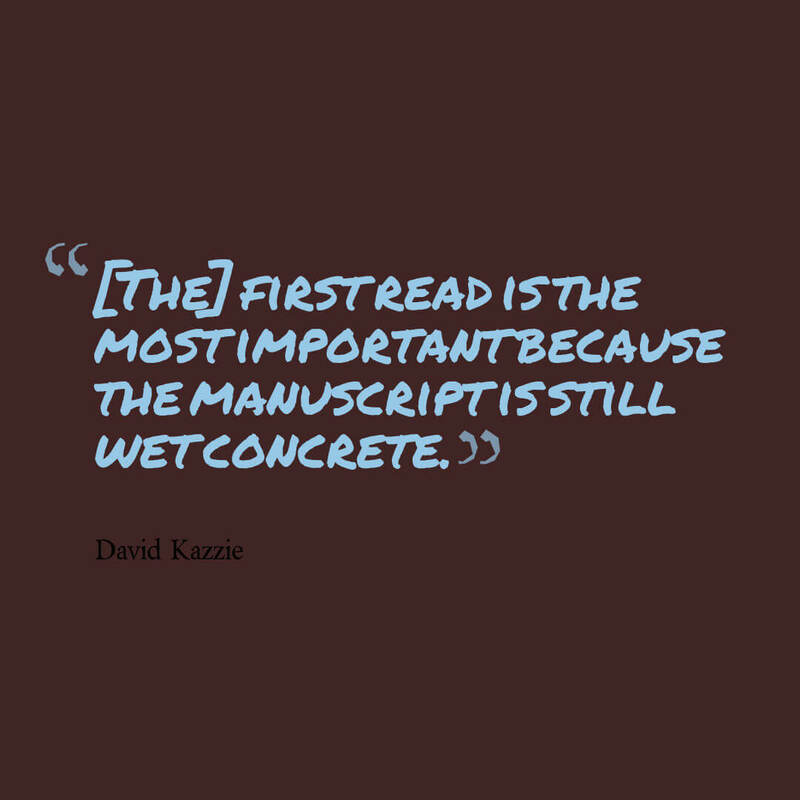 I’ve found—and this might be the most important thing I say in this interview—that this first read is the most important because the manuscript is still wet concrete—it hasn’t really started drying yet, and you’re more open to seeing problems and making big changes. After a second or third read, the manuscript will start to harden in your mind, and you’ll become more resistant to change. 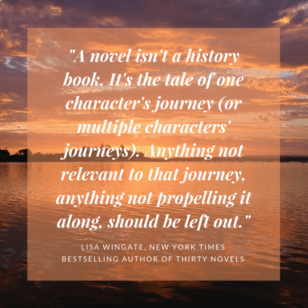 This is partly because after a couple reads, you will start to get sick of the book (I promise you will), and partly because it becomes more difficult to imagine the book in a different form. Your mind starts telling you that this is the book, this is the book, this is the book. Don’t be afraid to slash that draft to bits with a red pen—that’s a good way to remind yourself that the book is still under construction. For example, the first draft of The Living came in at around 100,000 words. My first read revealed a number of really big problems that I had to address (in fact, they were so big, I briefly thought about chucking the manuscript entirely). I ended up cutting around 30,000 words and adding 45,000 new ones. If I hadn’t been willing to address the problems early on, they would’ve begun hardening and become more difficult to repair. Then I start zeroing in on specific aspects—character, setting, story arcs, and so on. Kris: After that first read, how do you approach your changes? Do you have stages of edits that focus on different aspects of your book? David: I start with a wide-angle look at the book, mainly to make sure that the story holds together. When all is said and done, I’m trying to tell a good story that will have people turning the pages. Then I try to focus on each main or major character and make sure that I have done as much justice as I can to that person’s story arc. The primary subplot of The Living is the main character’s relationship with her 11-year-old son and whether she’s done him a disservice by being very overprotective in the first decade of his life. I think every parent struggles with this. I also had to be careful to look after the son’s story arc, as he changes a lot too—but this was tricky, because the book is told entirely from his mother’s point of view. It’s easy to give non-point-of-view characters short shrift, and I always want to develop the characters as fully as I can, even if the reader is never in their heads on the page. Setting is another thing I try to focus on. The Living is set a dozen years after a viral apocalypse that decimated humanity, so I wanted to really build out this world and make it feel very real. A second draft is a good place to flesh that out (but on the flip side, you have to be careful not to let the setting overwhelm the story). Kris: Which parts of the editing process are the most fun for you? David: I always love being able to solve a problem that I’ve found or make improvements—filling a plot hole, adding depth to a character, figuring out how to better challenge your characters using their own flaws and insecurities against them, thinking of a better scene, even if conveying the same information—these all make the book better. I enjoy seeing some of the themes that float up, especially ones that you were not cognizant of as you were pouring out that first draft. After a couple of reads, you’re like, “oh, so this is a thing that’s important to me.” Then you can focus on really putting a shine on those parts of the book. I also like using the editing phase to add little details, maybe some foreshadowing or symbolism that make the story more interesting. For example, there’s a tiny bit of foreshadowing in the prologue that I really love (even though you’re never supposed to love anything you write) and I only figured out to add it in a subsequent draft. The editing process also helped me come up with a much better ending for the story than the one that appeared in the first draft—particularly by being conscious of the character arcs. Kris: Which parts of the editing process are the most painful? David: When you realize something is significantly wrong with the book, a systemic problem that threatens everything. I wasn’t quite there with The Living, but I was close. I had to rip out a number of major scenes and start them from scratch. I probably had a dozen chapters that just sort of ended without any resolution to that chapter or any connection to the next one (or really any connection to anything at all). It took about four months to clean up. Plus with a revision that big, I basically had to look at the manuscript with the newly added 40,000-ish words as a first draft again. 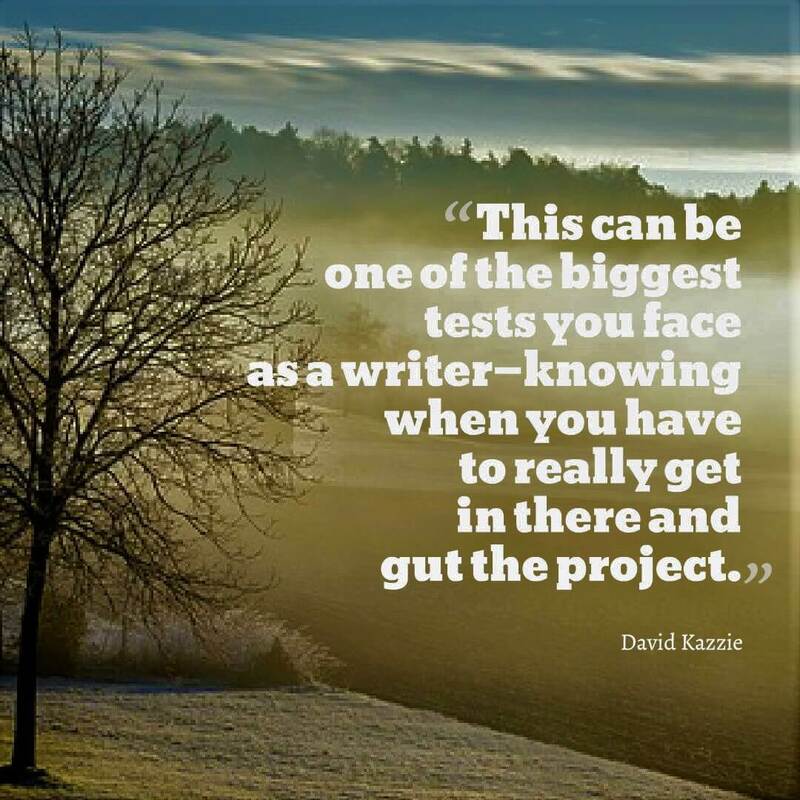 This can be one of the biggest tests you face as a writer—knowing when you have to really get in there and gut the project, even if you don’t necessarily have to start over. I do have an old manuscript sitting on my hard drive—probably my most original and best story concept—that does need a complete re-write. I remember doing my first read-through of the first draft and this growing sense of dread, the certainty that the book was so flawed that I would need to go back to the drawing board. That was really painful. I may be getting ready to go back and tackle that one—I like the story concept too much to give up on it. Kris: And now I’m intrigued. I hope you do! What do you look for when you’re trying to shore up your plot? Could you speak to strong pacing and story structure? David: I am a big believer in story structure, which I think does bear on pacing. As we all learned, the vast majority of books and movies adhere to the three-act structure, but that never really did anything for me until I learned how to break that down further and understand what each Act was supposed to contain. For example, I now know that relatively early in the story, as early as page 1, but certainly no later than page 50, you need to introduce the Inciting Incident. Every writer probably has their own interpretation as to what this means, but for me, it’s the event or incident that changes the status quo of the main character’s life—even if the main character isn’t aware of it or is not inextricably tied to it yet. This will send the protagonist on a path that will intersect with the inciting incident in some way at or near the end of Act I. It’s this intersection that launches the primary conflict that will power the rest of the story. In a way, it’s the yin to the ending’s yang. I also pay attention to the milestones that should fall around each quarter of the story, specifically, the First Plot Point (around the 25 percent mark), the Midpoint (this splits Act II into two more manageable sections), the Second Plot Point (75 percent mark). These really should be the most important turning points in the story, and simply by spacing them correctly, almost by default, you’ll bring a nice sense of pace to the book (regardless of whether your book spans one night or one century). These are all things to look for in editing—by keeping an eye on structure, you can decide if things happen too soon or too late or what-have-you and adjust accordingly. Kris: Do you use your original outline, character sketches, or pre-writing notes in your editing process? David: Sure, these can all be helpful in keeping you close to your original vision (if that’s what you want); in the case of character sketches, they can be helpful in seeing how the character has changed once you’re three or four drafts in. Kris: Do you have any advice about strengthening your characters to make sure they’re alive on the page? David: This comes with practice and reading authors whose characters made an impression on you. When you first start writing (and this happened to me), there is a tendency to make your protagonists very heroic, almost to a fault. It can be very challenging emotionally to see your characters as flawed people who’ve made mistakes, have regrets, think less-than-pure or selfish thoughts, and make bad decisions that they know are bad—possibly because it makes you confront, or at least acknowledge, those flaws in yourself. Kris: What do you wish you knew about revision a long time ago? David: To use the “Track Changes” feature (I write and edit in Word, no clue if you can do this in Scrivener). It seems like a simple enough thing, but it’s really helpful to be able to see all the changes you’ve made over the course of multiple revisions. It took me like three manuscripts to remember to do this because I’m generally an idiot. Kris: Aw. We all have things like that that we should have realized earlier. It was the power of using the “Find” and “Replace” functions that I wish I’d realized earlier. Now, you’re a lawyer by day. You know every word matters. How do you keep this in mind as you edit? David: Well, I think you try to make sure you don’t waste the reader’s time (much like a lawyer tries not to waste a judge’s or juror’s time in making an argument). I don’t think there’s any doubt that readers today are different than they were ten years ago because of the quick-hit nature of the Internet that we’ve all become addicted to. This doesn’t mean to dumb down your writing into click-bait or anything like that. But be conscious of the fact that many things are competing for your reader’s attention. Truthfully, that’s not really different from the advice of the past anyway—if something doesn’t HAVE to be in your book, it shouldn’t be. Every word and every sentence should have a mission. I like ending on this note. Every word and every sentence should have a mission. Every piece of a story needs to fulfill a purpose that supports the end goal. Every part of the writing process serves a higher purpose too, even if we each get there in a different manner. Through the brainstorms and drafting, revision and fine-tuning, we work and edit until the whole is everything it can be. We need to make sure we take the time to do it right, but I have faith, with the right effort, good stories can always get there. 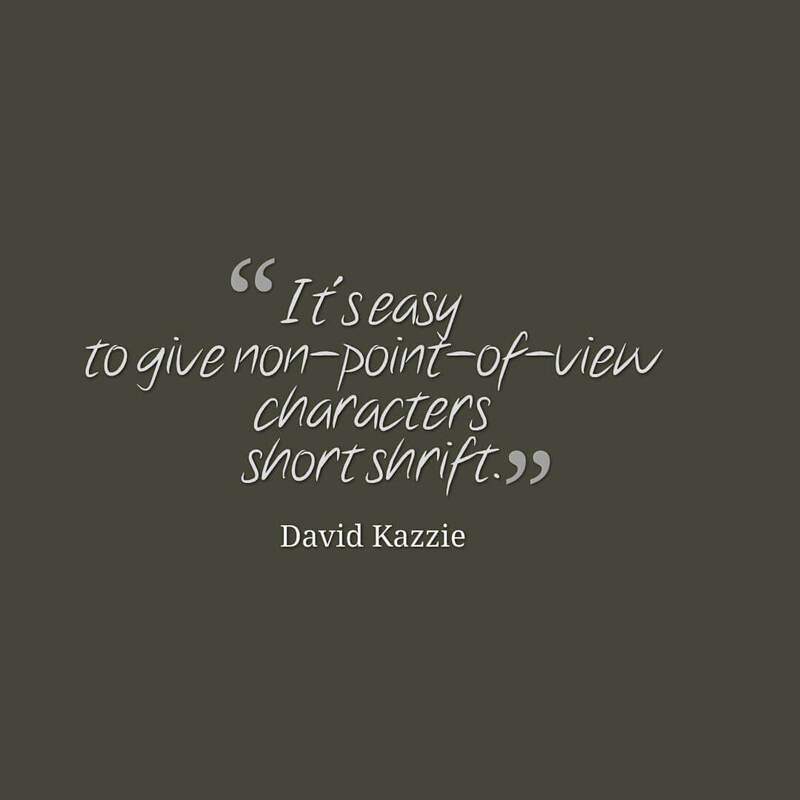 Thank you so much for your thoughts, David Kazzie, and happy writing, folks!